South Carolina is one of the most picturesque states to drive through. The winding, tree-lined roads can bring plenty of joy to drivers, but unfortunately accidents can happen even on the most beautiful streets. Car crashes can cause a range of injury, running the gamut from slight bumps and bruises to loss of limb or death. When an accident happens it is likely that there will be a combination of injuries to the vehicles occupants and each scenario will determine the severity of those injuries. The National Highway Traffic Safety Administration compiled 2011 crash data and revealed that there were 828 car accident fatalities in the state of South Carolina alone. When a motor vehicle collision takes place the victims can suffer serious pain and anguish both mental and physical as a result of their injuries. At the law offices of Harbin & Burnett we believe that car accident victims need an ally to represent their rights with competence and compassion. We will always fight for the MAXIMUM amount of compensation due to our clients to help them cover medical expenses, hospital bills, rehabilitative services and to assist them with the pain and suffering they experienced. To find out how we can help, simply fill out the Free Case Evaluation form located on the right side of this page, at the top. It is 100% FREE and there is no obligation to proceed. In addition, your information will always be completely confidential. When extreme force is applied to the cranium the brain can be injured, resulting in trauma that may be permanent and life altering for the car accident victim. 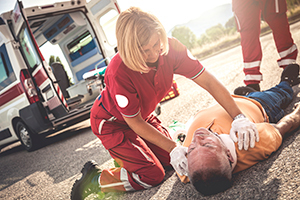 TBI is one of the most major causes of death and disability worldwide and car accident victims who suffer head trauma are at risk of developing this condition. Internal injuries do not always present themselves at the time of the crash or in some cases not until days later, which is why it is vital to monitor any changes in thought patterns or behavior and report the symptoms to a doctor immediately. The impact of a crash can fracture even the strongest bones in the human body, and bone breaks are an exceedingly common occurrence in these instances. Wrists are a typical place for small fractures to occur, but the kneecap, ribs, nose and skull are a likely source of injury as well. Bone breaks can take anywhere from 6 to 8 weeks or longer to heal, and in most cases will still be a weak area for the victim. Even the femur can snap completely if the crash force is applied in the right direction and amount. During a car wreck, debris can fly around on the inside of the vehicle or it can enter the car from outside environment. Lacerations are irregularly-shaped flesh wounds that are caused by blunt force impact to the skin, which tears it open. Essentially very deep cuts, lacerations can appear almost anywhere on the car accident victims bodies as they bounce around the inside of the vehicle. Similarly, burns can occur from the extreme heat of car parts that the body is exposed to in an accident. Both lacerations and burns are serious injuries that require immediate medical attention and can be life threatening. The spinal cord is a bundle of nerve tissue and support cells that extend from the brain to the tip of the furthest extremity. Messages pass through the spinal cord from the brain to the body and back, and trauma to this vertical column can permanently damage the ability to control certain parts of the body. Paralysis results when a certain amount of trauma occurs to the spinal cord, injuring it to the point that it cannot repair itself. Paralysis can be local or generalized and it refers to a loss of muscle control in one or more regions of the body. Motor vehicle accidents are one of the leading causes of spinal trauma and paralysis. 1 in every 50 people will be diagnosed with paralysis throughout their lifetime. An individual who suffers injuries from a car accident may die from them or perish upon impact. In either case, the person has suffered a terribly unfair demise, and the victims family may have a personal injury wrongful death claim. To find out how we may be able to help you with your accident claim, contact us today at (888)821-0247 and get connected with one of our experienced attorneys. You initial case consultation is free, of no-obligation, and you'll never pay a fee* unless you recover compensation.